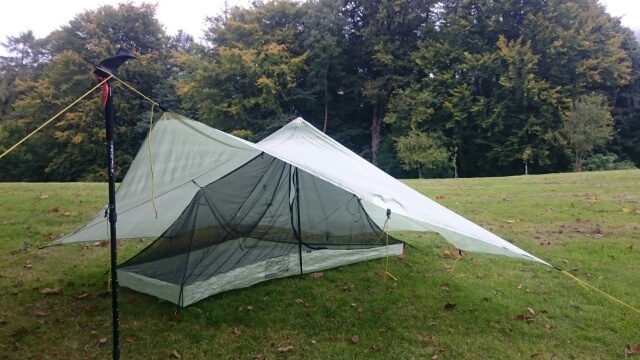 It's been about three years since I last wrote about the cuben Trailstar and a lot has changed. Back then I was falling in love with its light weight and proportions. But of course I was struggling to pitch it somewhat and that blog post may be off putting to some. What is lighter? Bigger? As flexible? Four season? I've used this year round, adding a bug net for summer and without one once the bugs go and in sub zero temps although you'd obviously not take it to the Arctic! Note later about spindrift. This post focuses on MLD cuben fiber, the Supermid and Trailstar. I've added the Supermid, if I don't you'll be waiting twenty thousand years for a blog on that! I think a comment on cuben fibre is the first thing to mention. It differs from silnylon in various ways, has pros and cons and I love the stuff! The best way to make shelters with it is bonding, not stitching it. I've noticed on one of my well used stuff sacks the cuben and stitching is fraying. 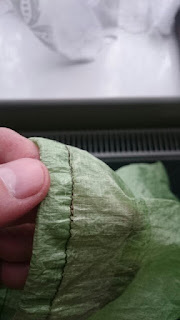 The beauty of cuben fibre is that it's easy to repair! Any good tape will work. I like tenacious tape. So this stuff sack will get a new lease of life. I've taken this opportunity to grab a dab of seam grip glue to seal all the stitching on my other stuff sacks. This doesn't include the dry bags as they are fully taped and seam sealed. The other wonderful advantage of cuben when bonded to make shelters is there are no seams to seal. So this saves time and the weight of additional sealant on silnylon. A few comparisons we can talk about is cuben doesn't stretch at all, this has advantages and disadvantages. You won't find your shelter sagging in on you after a night of rain and cuben is lighter. A disadvantage is that it probably won't last as long as silnylon which will probably last longer, is cheaper but has a tendency to sag when wet (pitch tight at night, often it's sagging after heavy rain or dew by morning) and is heavier. In these types of shelter, I'll take the financial cost along with the slight durability loss in time frame. Store cuben loose at home. Repeated folding / stuffing all reduce its lifespan. Cuben is arguably better in a fixed shelter, like the Supermid or a regular tarp. 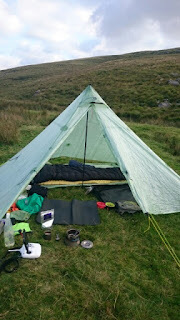 I did have huge problems pitching the Trailstar in cuben. The lack of stretch and working against the material caused many a headache early on in my usage! But I always knew it was my inability not the cuben! I never gave up and it was always my go to shelter. I look back and think potentially one thing I was doing "wrong" was the guy lines may have been too short. I've recently put new lines on at about 3.5 to 4 feet. Now this is overkill, but it makes things more adaptable and I'd recommend 3.5 feet lines and its then up to you if you go longer or shorter. For the Supermid I'd go two feet on corners and three to four feet minimum on mid hem / mid panel tie out lines. The cuben Supermid pitches lower than the silnylon version. I'd estimate 5'8" vs 6' plus. Considering its already a huge size, this is an advantage and is surely bound to be better in strong winds for having seemingly less exposed. I've not tried the cuben Supermid in strong winds, obviously due to its larger panels it isn't in the same ball park as the Trailstar for shedding wind. 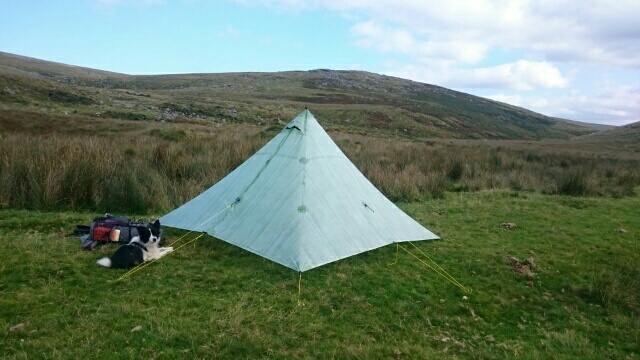 The silnylon version did well with quite strong wind on Dartmoor last year. But I doubt the wind topped 30mph. What I particularly love with the cuben Supermid is the huge space for zero weight! Ok 660g but that's nothing. Add a light groundsheet and solid pegs and you have a cathedral plus grounds for yourself and storage area for cooking and dog walking under one roof for sub 1kg! This thing is huge. You'll get three people in with room (tight) for kit. In reality, this is a perfect two person shelter with a dog or bike. The cuben Supermid is my second favourite shelter. Ok let's concentrate some more on the cuben Trailstar as that's really the focus here and my favourite! In 2012 I said if I only kept one it would be the silnylon Trailstar. Now, three years on, it would be the Trailstar still, but in cuben please! With practice I can now get a high pitch, using longer lines and a wide door when pitched low! Neither of which I could do three years ago. The longer lines help with the angles. I have also got a reasonable pitch with the door as a corner. The MLD inner fits well under the high pitch. Not so good under a low pitch, but a low pitch means cold or wind and in my opinion an inner isn't needed once bugs are not flying about, maybe unless it's snowing and spindrift is about. But I've not experienced that so can't comment. 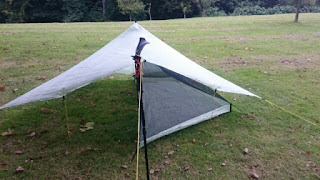 I'd pitch the Trailstar between 1m and 1.3m, this gives huge flexibility. These shelters do have a gap around the base, but that's fine for ventilation and I reply on my sleep system to keep me warm. The shelter keeps most wind off and all rain out! I've used both silnylon and cuben Trailstar in very strong winds, once each on Dartmoor, the first with silnylon I had to abandon due to rising waters and I was struggling to keep my pole up and hence the Trailstar kept collapsing. This wasn't a fault of the Trailstar but my pole. The cuben Trailstar behaved superbly in strong wind, the forecast was 50mph! I didn't sleep much that night for fear we'd all blow away, but that was my nerves and the noise of wind! I know cuben is noisy in wind, but frankly, anything like a tent / tarp / shelter will make a bit of a racket. I'll round of by thanking you all for the terrific support. 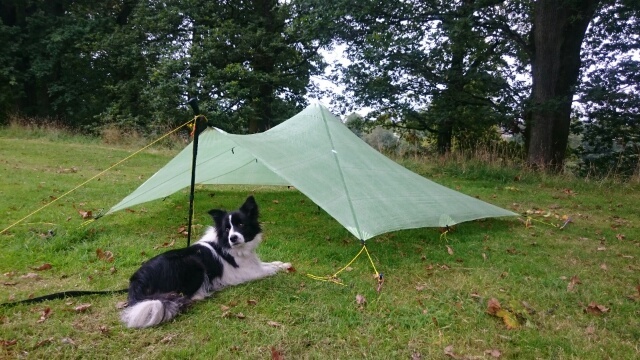 Good to see you're getting on with the cuben Trailstar. I need two things from a shelter - protection from rain and a windbreak. That's why I have taken to using a nest, with 18 inch high cuben all round, in all seasons. My first night under a Trailstar featured a sub zero draught on my face and I did not enjoy it. A nest sounds good, maybe one day Ron Will do a semi solid inner as they are popular I think and probably add degree of warmth. So far my bag and balaclava keep me warm. But I've not camped in deep snow with super high winds. Just very cold weather and was fine. Hi Tony. I apologise that this is a bit off-topic, but I tried commenting on your YouTube page and failed miserably. Anyway, I've just watched your video for kit selection for the Lake District, and please may I ask: where did you get that thin foam pad featured at the start of the video? I have a similar one from Gossamer Gear, but it has seen better days, is a bit short at around five feet in length, and I was hoping to find a replacement that's more readily available to us in the UK. Thanks, James. I forgot so asked a friend where it's available. Hi Tony, thanks for the videos - I've been trying to make up my mind whether to get a Trailstar. One of the things holding me back is what to use inside, in colder weather (I live in Scotland). I'm not a fan of proper bivi bags, but am considering a PHD Drishell bag cover, to protect against drafts and drips and to increase the warmth of my bag. Do you use anything over your bag, and what about a bag liner in winter? And for 3 season use when it's damp (always, in Scotland)? I see you use an inner - does it have mesh or solid walls? This is a dilemma, as in warmer weather I'd just want midge protection, which wouldn't block cold wind when winter comes. Any advice regarding the Trailstar or any alternatives would be much appreciated. Thanks and keep making the videos!